Digressions! 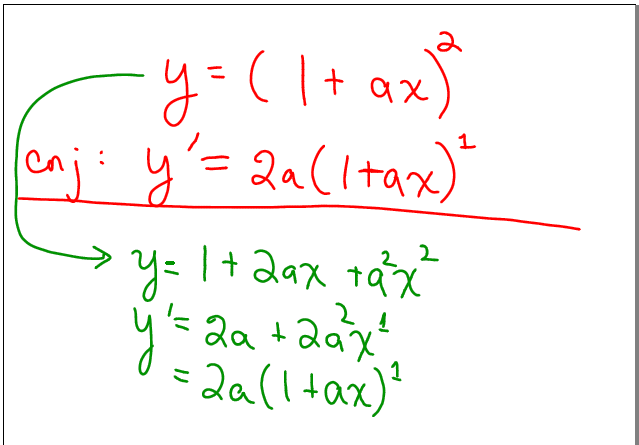 Hints of the Chain Rule via the Power Rule. In calculus today, I went off the beaten path a bit and it was a lovely digression. I think this works so well with my kids not only because they’re awesome, but because quite a few of them like to notice patterns and explore. So… for their work due today, they were asked to find the derivative of . And my kids wanted to go over this together in class. So when we worked it all out, we got . And then someone noticed that was the same as which looked like the power rule! Like if we had , the derivative would be , so similarly since we have , it’s makes sense that the derivative was . At this point, I decided I wanted to capitalize on this. So I said: okay, neat observation. Does it always hold? So they believed they had something that always worked… so I had them prove it. Which they did. 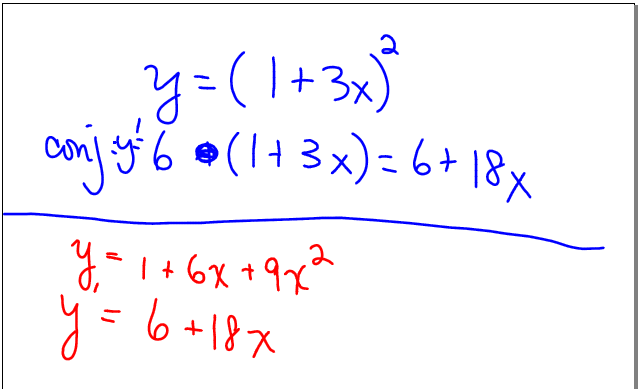 So now we had proved something about the derivative of , and I asked them: would it work to the third power? would it work to the nth power? And I left it as an exercise for their home enjoyment (our corny term for homework). I’m really curious to see who gets how far on this! It’s cool. They’re getting whiffs of the chain rule. I’m not going to give it to ’em or do anything else with this. We’ll wait a while. But I really like how this digression took 15 minutes, but it capitalized on something they were curious about. And we’ll see the connection later. I felt strongly enough about how this worked out that I engineered this discussion to happen in my second calculus class. I treated it like a big surprise. What a strange observation. Instead of forging forward in class, let’s take a digression. I loved that it worked a second time too. Did you let them in on the Wolframalpha secret? At least for expanding things like (1+ax)^4, it could be helpful. I wanted to really emphasize the idea of conjecture, test, revise if necessary, prove… because that’s what happened today. If they use wolfram alpha, they won’t be doing that, but they’ll just get the answer. 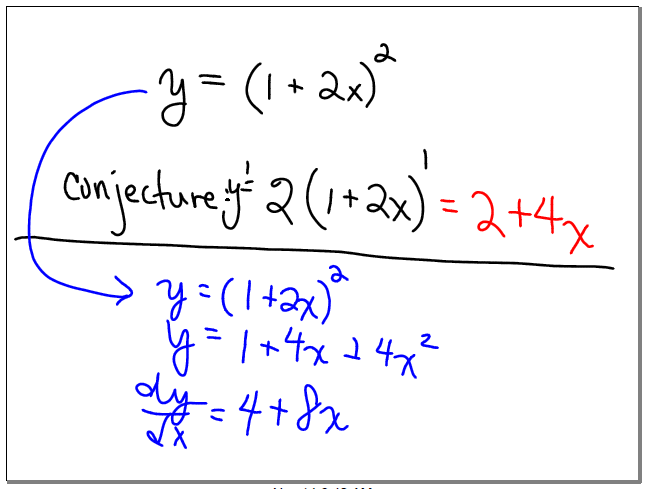 Like they could just type “derivative of (1+ax)^n” and be done with it. Why is it a digression? This seems like a perfectly legitimate piece of mathematics. Keen observation, then conjecture, then pursuit. I want this every day, but I don’t always succeed. I wonder if your second class will bite as well as the first. Please keep us posted. Thanks! It’s a digression because I didn’t plan it. (It wasn’t a tangent… this is obviously a perfectly legit piece of math.) I like to stick to my plans for the day, so following an observation and getting to a good place was fun. My class is not like this everyday. Just plain awesome. If only every class could be like this. I’d love to have been in your class! That’s much more intriguing than just throwing the chain rule out of the blue as it is usually done. I think it is always good to have an idea why something makes sense before trying to prove it.